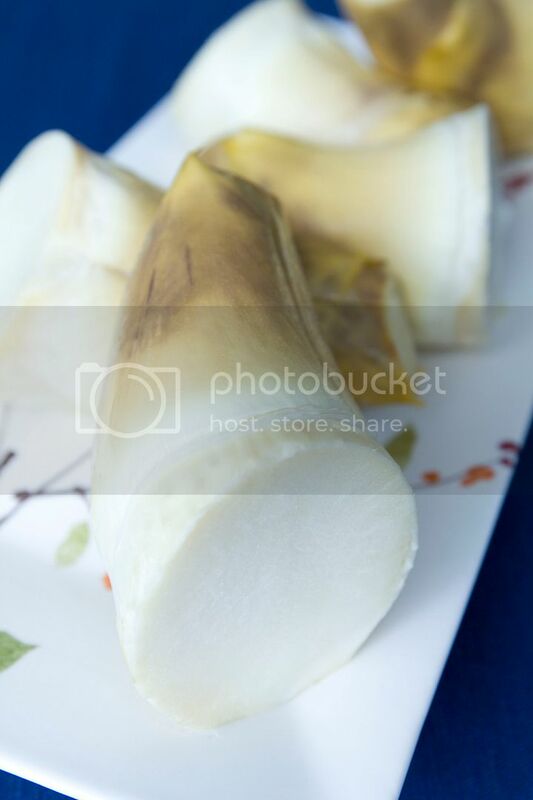 Bamboo shoot is in season now and can be found in Asian groceries. Some people dislike bamboo shoot because of its slightly bitter taste. However, if you get the top quality ones at the right months, you'll find yourself in love with this crunchy and delicate ingredient. Remove a few outer leaves and cut away the very bottom part of the bamboo shoots. You'll feel the resistance when cutting down the tough end on the bottom, this section remains tough and very hard to chew even after cooking. Transfer the bamboo shoots into a big pot. Fill up with water till the bamboo shoots are covered underneath. Bring to a boil and lower the heat a little to keep it simmer. It will take about 45 to a little more than an hour depending on the size of the bamboo shoots. 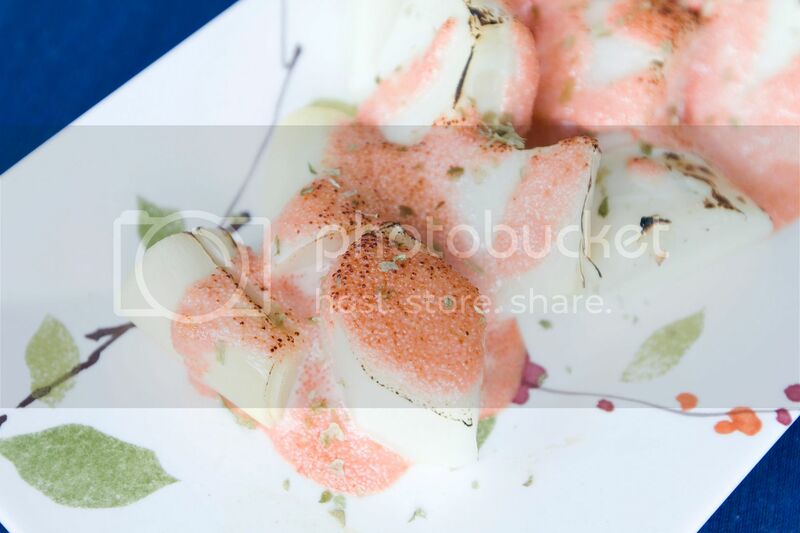 Test by poking a barbecue skewer or a wooden stick into the center and see if it comes out easily, if so, then drain and set the bamboo shoots aside to cool down first. Bamboo shoots at the stage can be stored in the fridge up to few days. Preheat the oven to 390 degrees Fahrenheit. Cut a slit and remove the remaining fibrous layers. If it's your first time working with fresh bamboo shoots, don't doubt yourself, the sizes for before and after peeling can changed by half, end up with small portion of crunchy and delicate insides. Chop them into large bite size pieces and transfer onto a baking dish. 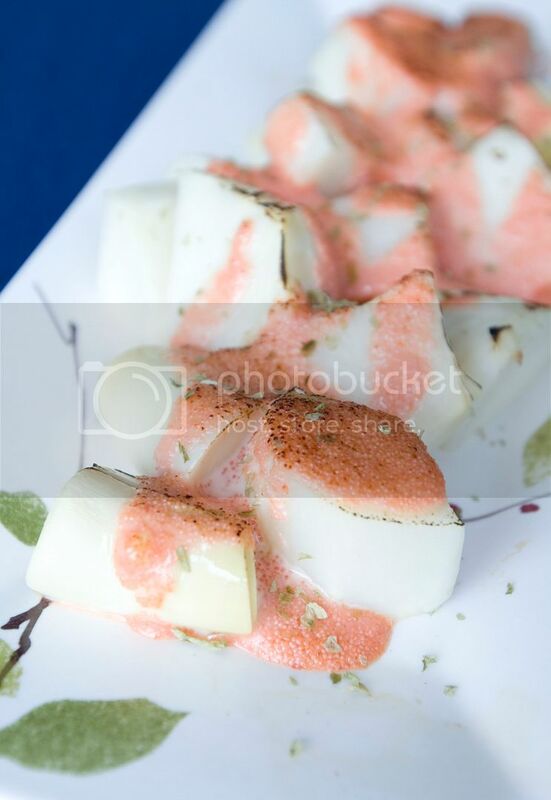 Mix mentaiko together with 1 tablespoon of Japanese mayonnaise and 1/4 teaspoon of mirin inside a bowl. Pour the mixture all over bamboo shoots and into the oven for about 5 minutes. Remove from heat and further darken the sauce using a torch gun if desired. Sprinkle with some dried seaweed flakes before serving. Bamboo shoots with mentaiko mayo, or otsumami in Japanese, similar to what American calls "beer food" but in much smaller portion, is even better when paired with sake. The condensed saltiness from the mentaiko adds a kick to the crunchy bamboo shoots. Lighter sake is recommended for this recipe.